Discussion in 'UFC Discussion' started by d0wnfall**, Jan 17, 2013. There is no doubt Belfort is slightly insane. Lol at him just starting to scream at Bisping "I'm READY WOOO I'm READY"
If I was Bisping i'd be creaming my pants realizing this psycho path is going to be locked in a cage with me. I think Bisping wins by a decision but, the second most likely scenario is Vitor getting a KO/TKO on Bisping in the 1st. I am excited for this fight and will be respectfully rooting for Bisping. He's definitely a weird kind of manic/depressive.... I have no idea what the root of it all is, but it's hard to predict and is equal parts exciting and disappointing. You'd cream your pants over that?? Never be intimidated by a man who goes "wooooo!." You'd cream your pants over this?? 5 Rounds with Bisping not being much of a finisher this could be one hell of a fight..
Lmao. Yeah I don't think that's what TS meant. Unless it was idk. i am a vitor nuthugger, and i'm proud. in fact i'd say he is the only fighter whose nuts i hug. I dare you to say that to Ric Flair. In that case I take it back. Flair is one scary dude. The only reason I would be scared of Belfort would be if I was locked in a room with him and his first words were "Have you heard about Jesus?" And they probably would be. 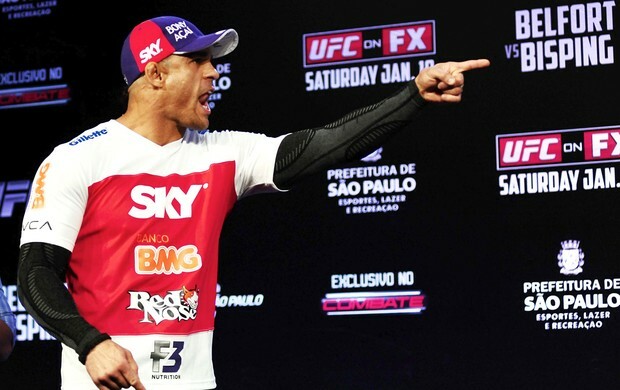 Vitor is fired up, should be a good one.